It’s been 3 weeks since I summited Everest from the North side. This was my second attempt. The first was in 2015 when our team and all the other teams on the mountain were stopped by the massive earthquake. 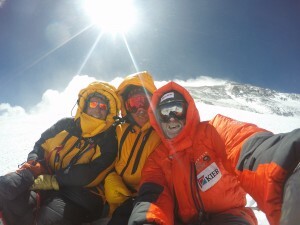 The Adventure Peaks team that year had reached the North Col before the Chinese Authorities closed the mountain due to the earthquake aftermath and fears of a second quake. 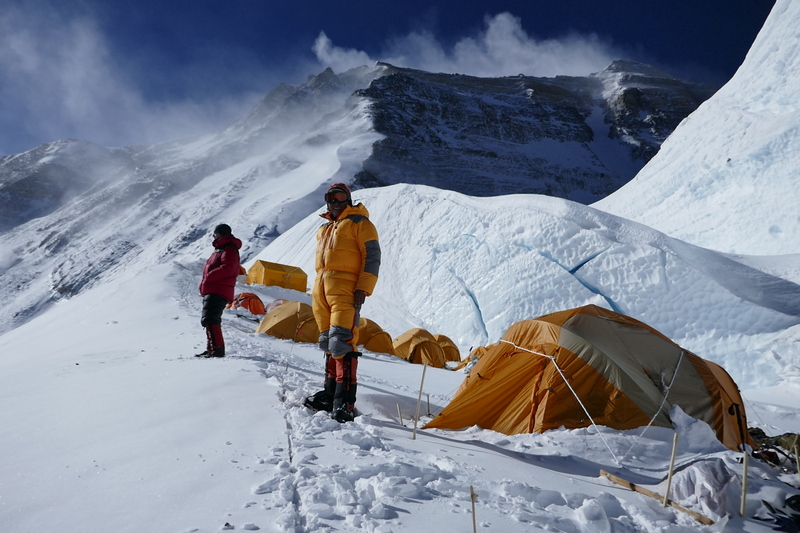 This year our expedition ran as smoothly as it could and 6 out of the 7 team members successfully reached Everest’s summit. The memories, images and friendships formed will live long. 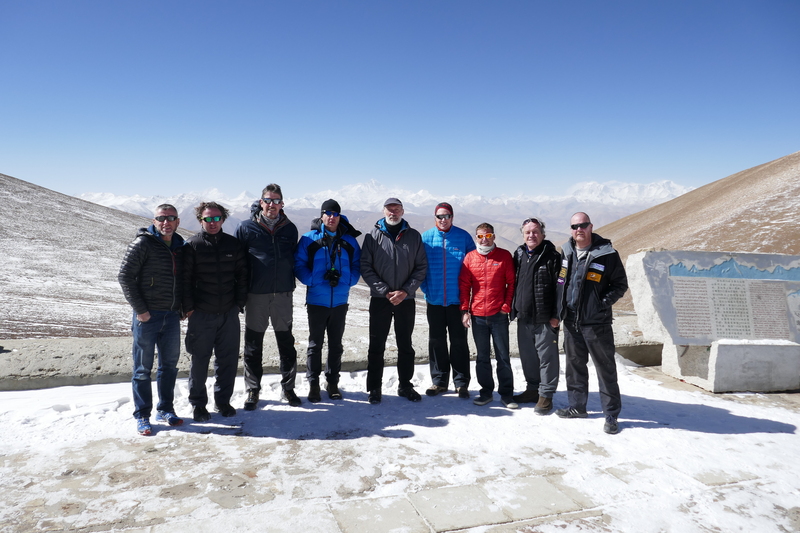 We arrived in Kathmandu, Nepal’s colourful capital, on the 1st April and summited on the 16th May, which made for a long build-up but it is absolutely essential to let the body acclimatise to the altitude, food and dry air. Our itinerary included plenty of time to acclimatise, to give us the best possible chance of being fit and healthy for our summit bid. At some stage on an expedition you will potentially pick up a stomach infection, bronchitis or simply a headache. The trick is to time it so that you are as healthy as possible towards the end of the expedition. For the first two weeks, we took a couple of jeeps and drove up into the mountains around Manang. Located just north of the Annapurna range in central Nepal, the Manang valley is close to the Tibetan border and remains an important yak and salt trading point. The area is spectacular and the drive from Kathmandu alone is world-class, with views of the Annapurnas and Chulu range to name a few. 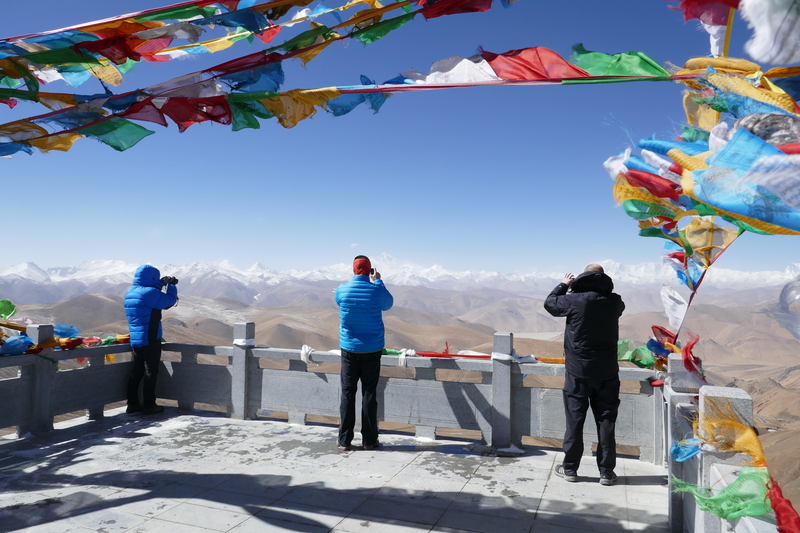 Our teahouse was at an elevation of about 3500m and we did several treks higher to an altitude of 5200m. Nothing too hard, we focused on just enjoying the scenery, getting to know each other and settling in. Plenty of time to flex muscles later. We returned to Kathmandu for two nights to buy any luxuries or additional things that we noticed we were missing in Manang and then jumped on a flight to Lhasa in Tibet. The flight is only an hour but goes right over our goal, Everest. We had ringside seats gazing down at the summit we would climb in 4 weeks. In addition we could see other 8000m giants of the Himalaya including Lhotse, Makalu and Cho Oyu. I’ve been to Tibet several times and it’s an amazing place. Tibet’s capital Lhasa is at an altitude of 3800m so it’s pretty high already and if we hadn’t spent time in Manang acclimatising, we would have been struggling to breathe. All the hotels there have doctors and oxygen in rooms on standby 24 hours a day for the tourists. 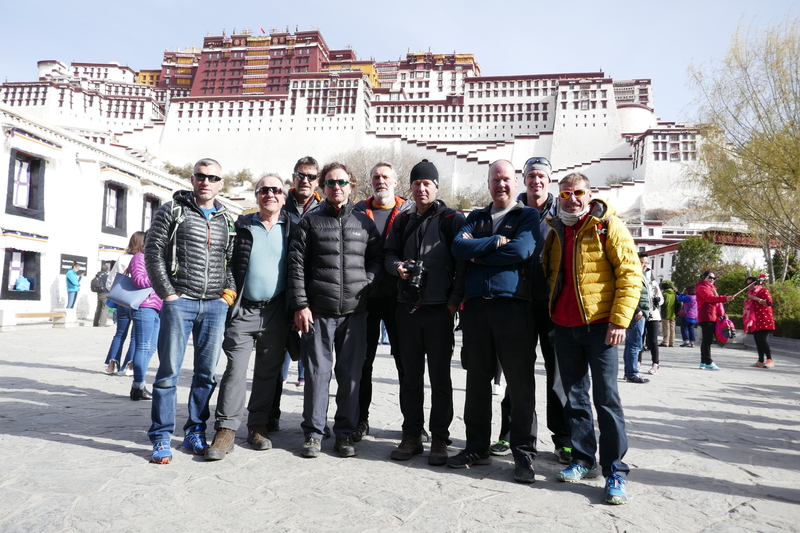 Visiting the World Heritage Site of the Potala Palace with its many steps told us we hadn’t quite finished our acclimatisation so it was lucky we had a 3 day drive ahead of us to Everest Base Camp. There is now a new road that drops you right beside your tent and it is stunning. 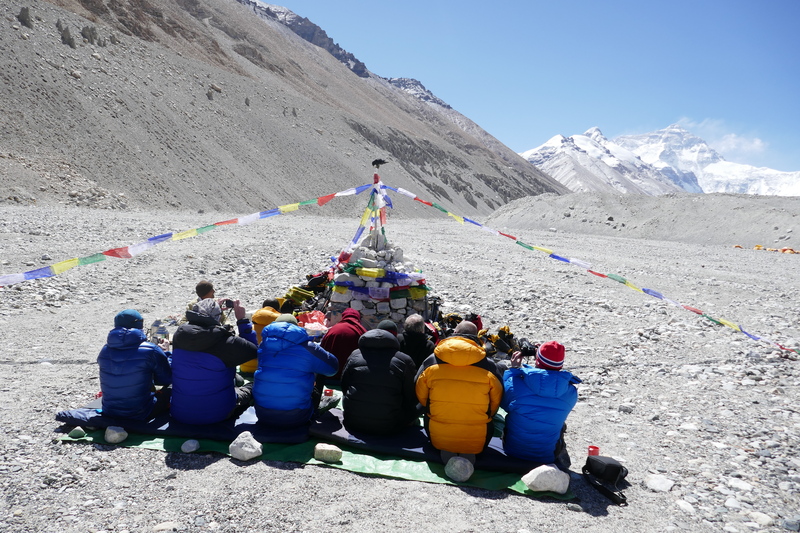 Everybody agreed we had been treated to two of the best drives in the world; to Everest Base Camp and to Manang. Everest Basecamp on the north side is at 5100m and would be our home for the next 5 – 6 weeks. It’s a large gravel area of morraine where the Rongbuk glacier has receded. The view of Everest is magnificent as the world’s highest peak looms high over you while you are sleeping, eating, washing… It really puts things in perspective. For me, it is so much more spectacular than the south side because you can see the full height of the mountain (rather than being obscured by Lhotse and Nuptse on the south side in Nepal). Our timing arriving at basecamp was perfect and the trucks that had brought our equipment from Kathmandu driving overland had arrived there a few days before us. 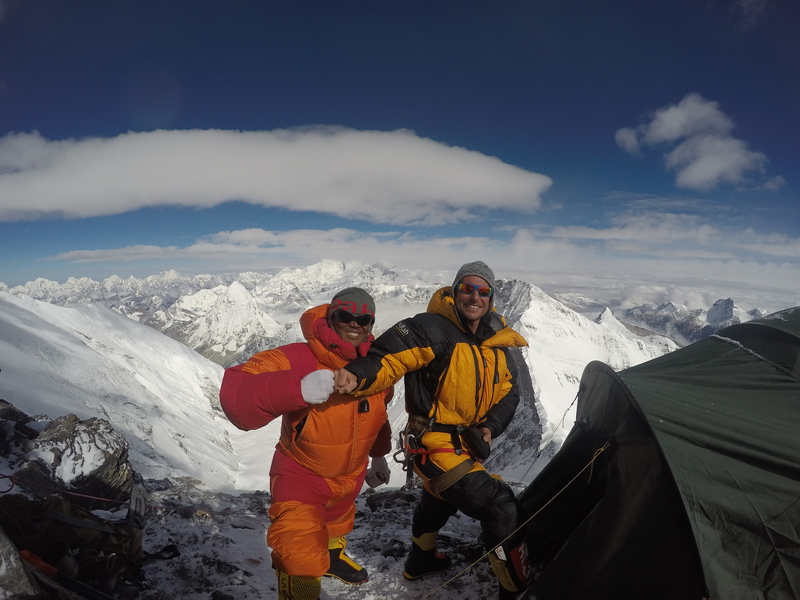 My long-time friend and 11 times Everest summiteer, Phurba, had set up all our tents and furnished them with pillows and towels. The mess tent was equipped with TV and DVDs and the barrel of luxuries was ready to be cracked open. This stash of treats such as apple pie and custard, bakewell tarts, jaffa cakes, Haribo, peanut butter and chocolate would keep us going throughout the expedition. The CTMA, the organisation in charge of permits and looking after the mountaineering activities in Tibet, had even managed to put mains electricity all the way to base camp and a man with a ladder came to our collection of tents, spliced some wires, added some bulbs and we were cooking. After a few day hikes from basecamp and then a rest day, we were ready to make our way to Advanced Basecamp (ABC) at 6400m. It is a huge height gain so we had to take our time getting there. ABC is very similar to BC and we would be spending a lot of time there. We had a big mess tent, individual tents, a cook tent, shower tent and toilet tent. ABC is also like a small village as it is so well set up. As it is 17km from BC the first time we went up we split the hike and camped at an intermediate camp on the way. 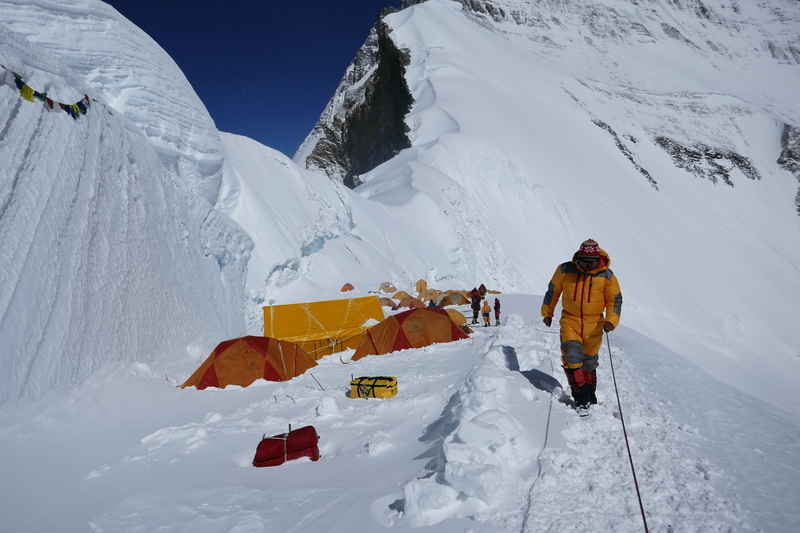 Everyone made it to ABC, some looking more tired than others but two days of complete rest were scheduled. After that we got the technical equipment out such as crampons, ice axe, jumars, belay device and did some practice on the nearby glacier. Always a good idea to test everything before heading up the highest mountain in the world! 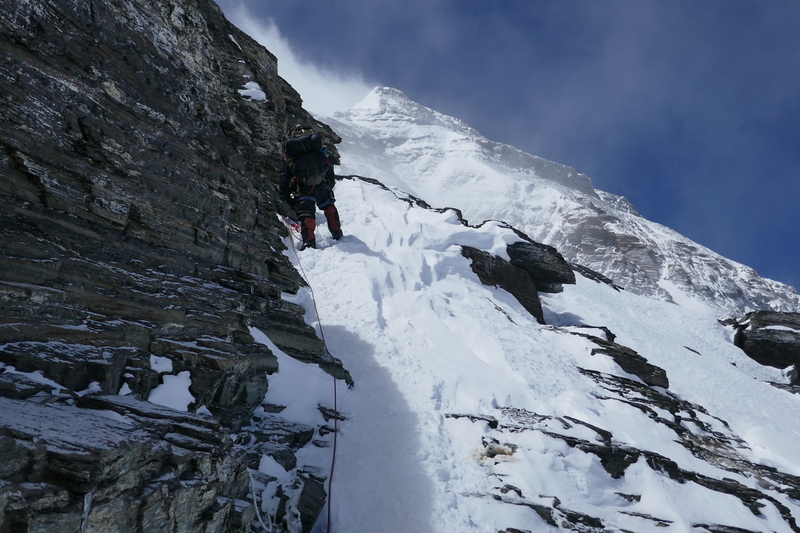 Following another rest day we headed up to the North Col at 7032m. 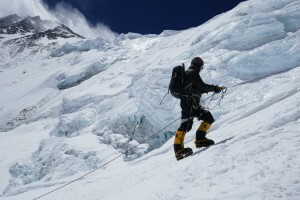 From ABC this is a steep snow climb that can take anywhere between 3 – 7 hours using jumars to ascend the fixed ropes. This year the snow conditions were excellent and although steep and hard, the climbing was great. One side of the North Col is more protected from the elements and this is where all the teams pitch their tents. From the North Col you get your first real feeling of what is to come. 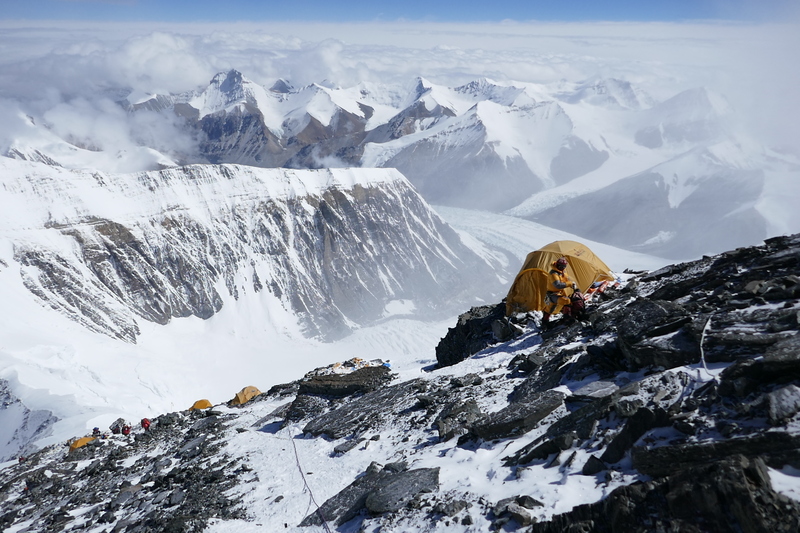 We tried to pick out Camp 2 at 7600m and Camp 3 at 8300m. They looked pretty close but were separated by a deceptively short but long snow slope and then bands of dark, fragmented rock that we could not see a line through. 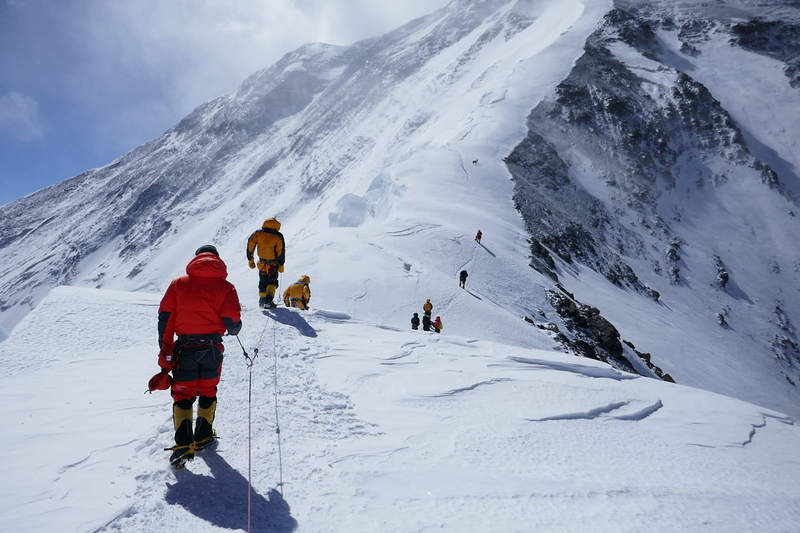 Thankfully this year the rope fixing teams on the North side did a fantastic job, finishing exactly on time and running perfect lines all the way to the summit. The first time we went to Camp 1 at the North Col we only stayed a few hours then headed back to ABC. 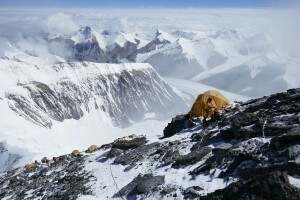 The next day we descended back to BC for a much longer rest – if that is possible at 5200m. Three or four days is about as long as excited, adrenaline-driven climbers can sit around at BC and we headed back up to ABC. This time in 1 go. What had taken two days, now took between 5 – 8 hours. By this time Kilian Jornet had met our group and impressed us with a stroll up in 4 hours! Another few rest days at ABC and we took our sleeping bags and downsuits to the North Col with the intention of sleeping high for a few nights. It was great to actually be on the mountain. As can be expected, sleep was not great the first night and also it was the first time we were eating dehydrated mountain food! We looked forward to getting back to Kami, our wonderful Nepali grandfather figure and cook at BC. 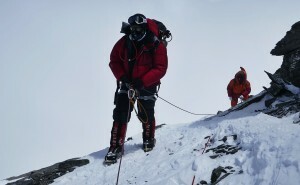 The wind was howling in the morning but we were so excited we put our downsuits and goggles on and headed up. It was awesome. The summit felt within touching distance, although we knew it wasn’t. We reached 7500m and headed back down. The next time up here we would be going all the way. Again we repeated the routine; down to ABC then BC. Now we had to wait for a good weather window. Everybody was so fit and ready to go. A few days rest at BC and we decided we needed a change of scenery and altitude. 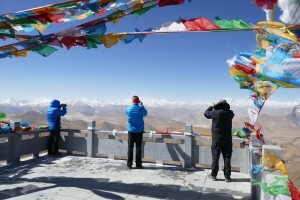 The helpful CTMA arranged some jeeps for us and a hotel and we headed back to New Tingri for two nights at 4200m. Although not hugely different from life at BC, it was awesome and refreshing to sleep in a bed with electric blankets, have warm showers, unlimited wifi and just walk down the street looking for a restaurant. 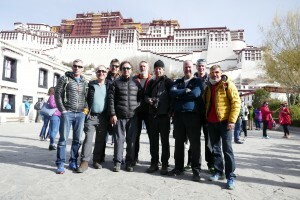 The Everest North experience has really changed over the last few years, standards have improved dramatically with the help of the CTMA; the hotels are excellent and the roads are great. Our weekend break was great and we hitched a ride to the next town of Shegar with its monastery, markets and restaurants. We returned to BC refreshed, and spent a few more days resting there before heading up to ABC. There is always lots of talk amongst teams about weather and this year the windows seemed particularly short and liable to change at any moment. 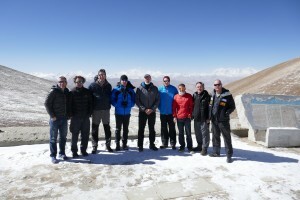 In the end we picked a good time to ascend and around 17 people summited Everest on the 16th May with us. We were worried that high winds could come in on the 17th May early in the morning so we set off at 7pm on the 16th. 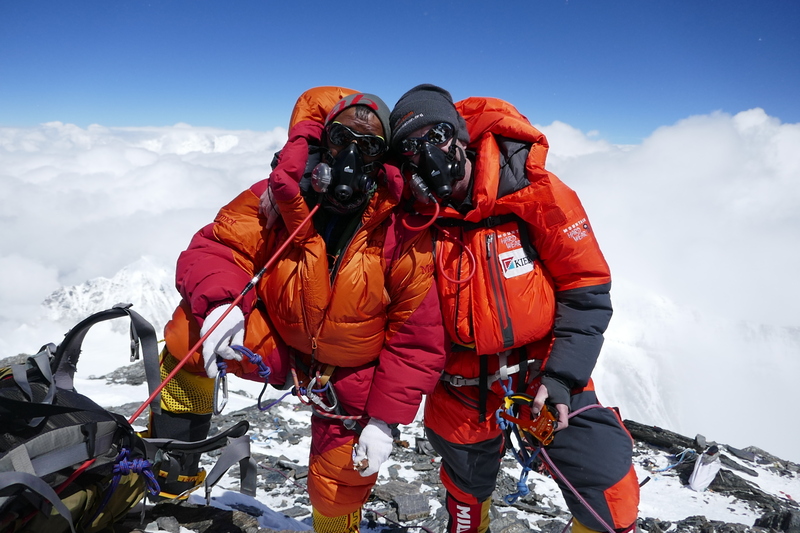 Typically they didn’t in the end, and we climbed Everest’s magnificent North Ridge in the dark and summited in the dark at 02.30am. Summit day is absolutely spectacular. It is technical but not overly difficult. The fixed ropes were masterfully positioned, as were the ladders, and the intricate and winding nature of the final 7 hours will be imprinted on everyone’s mind for a long time. From BC, the North Ridge looks gently sloping, however it’s not – it is truly magnificent. A lot of expeditions are judged by their success. 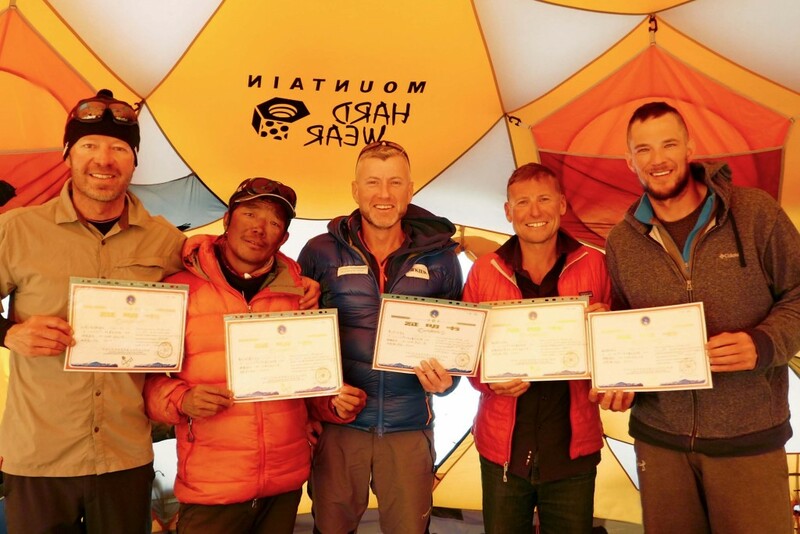 What made this a great expedition, besides our outstanding Sherpa support team, were the clients who threw themselves into every aspect; listening, contributing, carrying, helping each other, even taking over the cook tent and preparing 4 course dinners. Everybody made sound decisions and even after 3 weeks, we are still buzzing. Sean James Sean is a technical 5.14 climber with extensive experience on the north faces of the Alps. 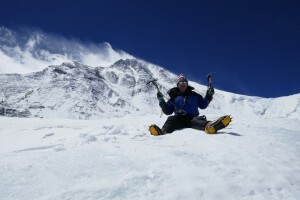 He has previously lead and summited Broad Peak and Spanitk in Pakistan team. Other notable ascents as expedition leader includes the technical peaks of Ama Dablam, Khan Tengri, the East ridge of Mount Logan and Dych Tau in the Caucasus mountains in addition to many less technical peaks including multiple ascents of Cho Oyu, Aconcagua and many of Nepals ‘Trekking Peaks’. He has currently completed five of the ‘Second Seven Summits’ and is well motivated to climb K2 and Mt Tyree to be the first British Mountaineering to complete the seven.